Shredding up to 5 sheets of paper at a time, the Rexel Alpha Cross-Cut Shredder is ideal for use as an everyday home shredder. Each shredded sheet is cut into small confetti-style pieces measuring 4mm x 38mm and this gives the shredder a P-4 DIN security rating. This makes it suitable for highly confidential document shredding, perfect if you want to shred the family bank statements and other sensitive household documents. As well as paper, you can also shred credit cards and staples with this shredder, very handy if you have old bank cards you want to shred or your papers are attached with staples and you don’t have the time to remove these prior to shredding. 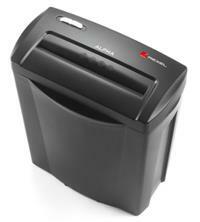 The shredder has a 14 litre waste bin which is easy to empty as the head just lifts off. Plus, the bin holds up to 60 shredded sheets at a time before it needs to be emptied. For safety the machine comes with a thermal overload system which helps stop the shredder from overheating (n.b. the shredder can be operated continuously for up to 3 minutes - if the motor then gets too hot, the thermal safety switch will start working automatically and the machine should be left to cool down for about 30 minutes). A reverse option is also featured on the shredder to help clear any paper jams, should they occur. Paper entry width is 224mm for A4 shredding. And for your peace of mind, the Rexel Alpha Cross-Cut Shredder comes with a 2 year warranty.